The digital Revolution started in 1950 changes all the existing mechanical and analog electronic structures into digital computers. Since the growth of digital electronics has been exponential, today it is almost impossible for a person to resist using any electronic equipment. Starting from the alarm clock that wakes you up and the toaster that serves you breakfast, everything is a contribution from digital electronics. 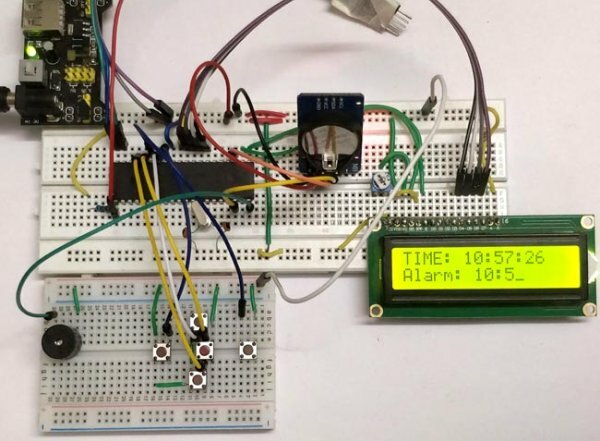 Thinking of all these it is really exciting to program our own stuff that could do simple yet useful tasks, like the Alarm Clock that we are going to build in this project with PIC Microcontroller. This alarm clock will have an 16×2 LCD display which will display the current time and set time. We will use few push buttons to set the alarm time whenever required. The current time will be kept in track using the DS3231 RTC moduleand we will use IIC communication to get these values from the RTC module. We have already learnt about the RTC module and how to interface it with PIC. So it is recommended to read through that tutorial, we will be skipping most of the information covered in that tutorial. 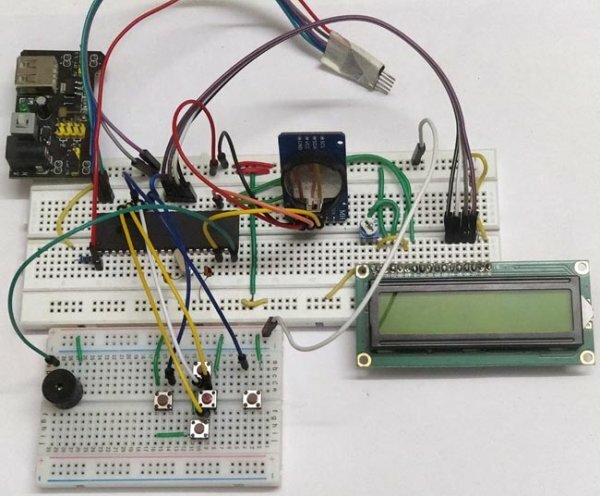 This project requires you know few basics about the PIC microcontroller and how to program it. We will use GPIOs, LCD display and RTC module for this project. 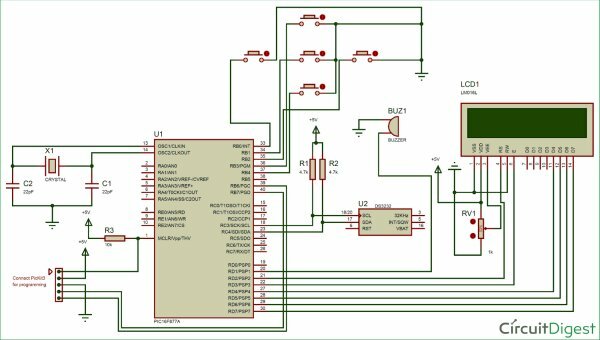 The circuit diagram for this PIC based Alarm Clock Project is shown below, which was created using the proteus software. The will also be used for simulation further in this project. The five push buttons will act as an input for setting the alarm for the required time. So one end of all the push buttons are connected to ground and the other ends are connected to PORTB pin, internal pull-up resistor will be used on these pins to avoid the pins floating. The Buzzer will act as an output and will give us a beep when the alarm gets triggered and is connected to the PORT S pin. The current time is always kept in track by the DS3231 RTC modulefrom which the PIC receives the data through I2C bus, so the SCL and SDA pins of the RTC module is connected to SCL and SDA pin of the PIC controller. A LCD display is attached to the PORTD of the PIC which is used to display the current time and set time. Learn more about using DS3231 RTC module with PIC here. I have used a breadboard module and 12V adapter to power the module. This is my source of +5V supply voltage. Also I have to use two breadboards to keep the circuit clean. You can also solder the whole circuit to a perf board if you are looking to make more robust project. The complete PIC program for this Alarm Clock project can be found at the bottom of this page. This project also requires three libraries for using LCD, I2C and RTC with PIC. The complete code with header files can be downloaded from the ZIP file here and can be opened using MPLABX after extracting. Further below I am just explaining the main c file as small snippets. You can fall back to the above mentioned tutorials if you want to know how the header files work. Since we have the LCD and I2C header file linked with the main program, we can start the LCD initialization by calling a simple function. The same can be done for I2C initialization as well. Here we are starting the I2C communication at 100kHz since the RTC module works with 100kHz. //Remove the below line once time and date is set for the first time. Next inside the while loop we need to read the current time and date from the RTC module, this can be done by just calling the below function. Calling the above function will update the variables sec, min and hour with the current value. In order to display them on the LCD screen we have to split them in to individual characters using the code below. Next, we update the values over the LCD screen. The current time will be displayed in the first line and the set time at which the alarm has to be triggered is displayed on the second line. The code which does the same is shown below. Now, we have displayed the time and set time on the LCD we have to check if the user is trying to set the alarm time. To do this the user has to press the middle button, so we will check if the middle button is pressed and toggle a variable to enter into alarm set mode. The same button will be pressed again to confirm that the values are set and in that case we have to come out of alarm set mode. So we use the below line of code to change the status of the variable set_alarm. While using a push button with a microcontroller or microprocessor there is one common problem to tackle. This problem is called as switch bouncing. That is when the button is pressed it might give noisy pulses to the MCU/MPU which might fake the MCU for multiple entries. This problem can be solved by adding a capacitor across the switchor by using a delay function as soon as the button press is detected. This type of solution is called de-bouncing. Here we have used a while loop to hold the program in place till the button is released. This is not a best de-bouncing solution but for us it will work just fine. Similar to the left and right button, we also have the upper and lower buttons which can be used to increase or decrease the value of alarm time. The code to do the same is shown below. Notice that each character of the set alarm time is addressed by the index value of the array. This was we can easily access the required character whose values has to be changed. Once the alarm time is set the user will press the middle button again. Then we can start comparing the current time with the set time. The comparison by checking if every single character of current time is equal to the character of the set time. If the values are equal then we trigger the alarm by setting the trigger_alarm variable else we just compare till it gets equal. If the alarm is set we have to beep the buzzer to alert the user for alarm. This can be done by simply toggling the Buzzer at a regular interval as shown below. The simulation becomes very useful when you are trying to add new features to the project. 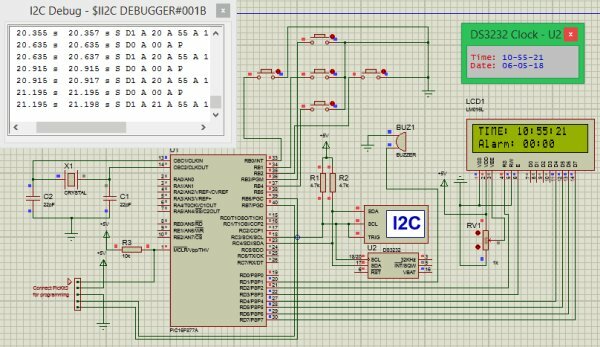 You can also use the I2C debugger module to check what data is going in and coming out through the I2C bus. You can try pressing the buttons and also set the alarm time. When the set time is equal to the current time then the buzzer will go high. Build the circuit on the breadboard, get the code from the download link and compile it using MplabX and XC8 compiler. If you have downloaded the code from the ZIP file provided here, then you should have no problem compiling it since the header files are attached already. 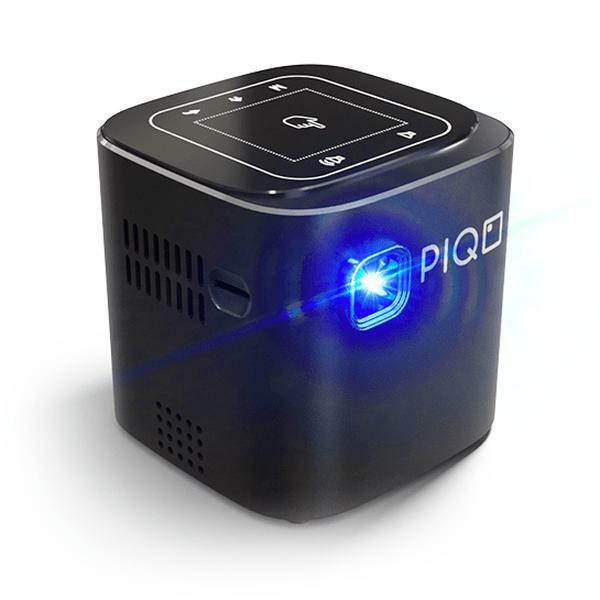 After compiling upload the program to you hardware using the PicKit3 programmer. The connection to connect the pickit programmer to PIC IC is also shown in the circuit diagram. After the program is uploaded you should see the intro screen and then the time being displayed you can then use the push buttons to set the alarm time. My hardware set-up when powered looks like this below. When the alarm time matches with the current time the buzzer will start beeping to alarm the user. The complete working can be found at the video below. The project has a plethora of options to build upon. The RTC module can keep track of any time and date, so you can perform a scheduled task at any time/date required. You can also connect an AC appliance like a fan or light and schedule it to turn ON or OFF when required. There are still much more you can build upon this project, let me know what idea comes to your mind as an upgrade to this project and I will be happy to hear from you. Hope you understood the project and learnt something useful from the process. If you have any doubts in this project use the comment section to post them or use the forums for any technical help.